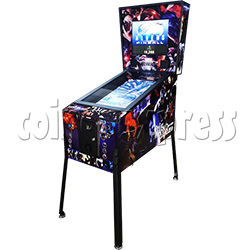 The 32 inch LCD screen appears 3D multi-angle high-definition targets and flippers on the playfield and turns player on with all the shots with realities pinball game fun. The game characters include Netherlands, Brazilian, Germany and Argentina Team for option to play the most exciting word cup game. World Cup Battle Video Pinball Machine is available to adjust the height for everyone's height requires, attracts for any kid or adults.